We are engaged in offering a large variety of premium quality Shamiyana tents. The shamiyana tents are a single fly and flat roof tent, which are ideal for the occasions like Weddings as well as Parties. The shamiyana tents offered by us, is made out of the two layers of high quality fabric. We are engaged in offering a large variety of premium quality Shamiyana tents. The shamiyana tents are a single fly and flat roof tent, which are ideal for the occasions like Weddings as well as Parties. 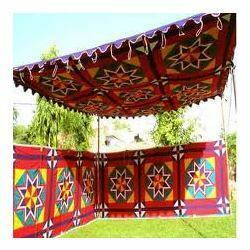 The shamiyana tents offered by us, is made out of the two layers of high quality fabric. The outer layer is made of waterproof cotton canvas whereas inner layer is made of a beautiful floral printed sheeting.